This power may very well prove to be just the extra boost you need in order to elevate your spiritual mastery and to tap into your mind’s, soul’s and body’s true inner potential. Spirit stones have long been lauded and cited in scriptures, myths and folklore for centuries. Keeping with this ancient tradition, each of the stones are all-powerful, with the ability to protect you as their owner from negative spirits and energies. Spirit stones are inherently more potent than mere crystals and gemstones. This natural potency is then amplified in these elite stones’ indwelling spirits and magickal properties that are there for your benefit. This greater empowerment can then be applied to magickal rituals or simply your regular meditation sessions, allowing you to focus your energies and occult powers towards achieving your desired goals and ambitions. These Stones empower your thoughts, Aura, any quest or spiritual task you undertake, prayers and any protective measures you take as a regular practice. Additionally, the elementals within can guide you in spell-casting, as well as offering practical advice in your daily life. Unlike crystals and gemstones, which demand constant programming just to act upon (much less accomplish) a single task,spirit stones allow you to “assign” multiple tasks with practical, positive magick that will not only transform you, but your entire environment. However, by directing your stones’ elemental to perform a single, specific task, you’ll find a heightened potency and rate of success. You don’t have to orchestrate elaborate rituals or rites of empowerment to carry out in order to attune yourself to your new stone. The process can be as simple as holding the stone for a few minutes each day. The more 'work' or connecting you do with your stone, the faster you will see results, most people notice their lives begin changing in a few days, after 40 days a full link is established, with the use of mantras, you will quickly form a psychic telepathic relationship, where you will be given answers and shown methods for further development and uses to empower your life with the stone. By using and handling your stone regularly, the etheric link will be formed naturally over time, just like any relationship. We recommend holding your spirit stone during meditation, so that you can get in tune with the stone’s energy as it gets familiar with yours. Aided by the power of the visualization process, the etheric link will grow and strengthen. However, to facilitate this process, we provide you with the name of the indwelling elemental, which will allow you to communicate more effectively and powerfully. A way to tap into the powers of your magickal stone is to immerse your stone or stones in water for a few hours. Once the hours have passed, reserve the water for use in ritualistic baths, combined with pure and natural essences, oils and flowers. The resulting magickal “potion” has the power to purify your aura and eliminate negative forces and energies in your life. A second practical application is to strategically place them around your home and/or office. By incorporating them into your everyday environment, you’ll uncover a greater capacity to neutralize negativity, encouraging positive energy, attracting luck and, in professional settings, drawing new clients into your establishment. If your business is a therapeutic or healing centre, weaving our stones into the décor will allow the healing to begin from the moment clients and patients step through the doors – neutralizing negative attitudes, calming agitated auras, fostering positive thinking and creating an all-around better working environment for everyone! Yogis and tantric practitioners have been utilizing mantras since ancient times. There are a number of reasons that these mantras play such an important role. Magickal practitioners employ mantras to replenish their own magickal capacities or to recharge themselves with stronger energy. Mantras can affect our chakras, with certain mantras forming bonds with specific chakras – awakening and attracting power in and to that particular chakra, providing stimulation and purification. In light of this, we’ve psychically detected the specific mantra that’s associated with your new spirit stone. We include this mantra in the instruction package provided with the stone, each one has a personal mantra, and it's own name, you will be told whether the spirit is masculine or feminine. Mantras have proven a powerful way to connect with your spirit stone. This mantra will attune and amplify the stone’s natural vibrations and fosters a bond between you and the indwelling elemental. We suggest you employ this unique mantra while meditating or in conjunction with a rosary/mala or prayerbeads – concentrating and focusing your attention on the mantra and the vibration it manifests during repetition. This mantra acts as nourishment for both the stone itself and the nature spirit it contains. It helps to increase the stone's key virtues and powers, and then transfers them to you, the owner, with frequent use. Many have reported that by constantly chanting their mantra, they’re able to accumulate power reserves, and uplift their consciousness, taking advantage of the stone's benefits more rapidly. Because of this, we suggest that you keep your stones AND mantras close at hand (we mean this literally, since grasping your stone in your left hand during meditation can assist in absorbing energies easily. Your psychically divined mantra will foster the relationship-building needed to maximize the power of your stone. Greater power equals greater results. We provide this mantra to you at no additional cost, it’s up to you to decide if this method melds with your own personal tastes. Spirit Stones are constantly alive with energy and powerful vibrations. Attuning with your stone will take some time and effort, the mantras and recitation of the spirits name expedites this greatly, these are just yet another way to tap into their mystical powers. We do highly suggest using mantras with your stone specially the ones given in your psychic reading, this brings many benefits over time under constant use. Spirit Stones provide you with a protective buffer against a myriad of negative forces. Because of this, it’s essential that you take steps to regularly cleanse your stones. You can purify your stone by placing it in a glass of water with at least six teaspoons full of salt. Larger stones may require more salt – ideally enough to cover the entire stone. Of course, some are much too large for an actual glass. Simply find a container large enough cover the stone with a layer of salt and then add water – filling it to the top. The purification process needs at least 48 hours of immersion to cleanse the stone of the negative dross and psychic attacks it’s been shielding you from. This negative energy is transferred from your stone and into the salt that surrounds it. Once the 48 hours is up, remove the stone and pour the remaining saltwater down the sink or drain. This process is ESSENTIAL to keeping your stone and its elemental spirit operating at full strength. 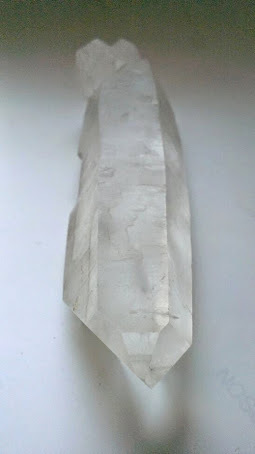 Because purification is so important, during the psychic scanning process we use to identify the unique mantras and elementals associated with each stone, we carefully work to detect any pre-existing negative energies that may have been absorbed from previous owners or the shamans who’ve handled them. If negative forces are identified, not only will we cleanse them psychically, but physically as well, restoring the stones' to their original, positive vibration. As rare and priceless as Spirit stones are, there’s no reason you should restrict yourself to just one. Not only is owning more than one stone perfectly safe - it can also be incredibly advantageous. While possessing certain gemstones that are related to astrological influences can prove greater harm than help, spirit stones are free from this potential negativity. Once you’ve established an etheric link with your spirit stone, you’ll strengthen your bond with the indwelling elemental’s higher evolved intelligence as well as their dedication to attracting positive energy and holding negative energy at bay. Owners of multiple spirit stones soon find that their various stones actually work in harmony with one another. Collectively, they won’t harm one another, you or the surrounding environment. Not only can you own multiple spirit stones, but you can also safely store your stones in close proximity – even set into the same jewellary, if desired. It’s also safe to house your stones together in shrines, altars or other offering areas where oils and incense are put forth as gifts to the dedicated deities. Indeed, you can even make offerings of fruit, coffee or milk to the indwelling elementals that give your spirit stones heightened power! Across the ages, dedicated devotees and spiritualists have set up magnificent shrines to honor gods, goddesses, deities, saints and other sacred figures. Because of this, shrines are often arranged with certain religious and sacred objects in order to enhance the power of the shrine. Incorporating spirit stones into the design of your shrine can boost not only the power, but also your ability to align yourself with the higher intelligence that the shrine is dedicated to. Your shrine can be customized to help manifest desired outcomes, to serve as a meditation space, or to facilitate certain spiritual exercises. Your shrine is, essentially, your sacred space. Whether at home or in the office, your shrine can and should be constructed to generate the positive and nullify the negative energies, both internally and within your surrounding environment. Configuring your shrine offers limitless possibilities. Some configurations work to attract luck or prosperity. Others fight off negative thinking and potentially damaging psychic attacks. Yet others work like a magickal magnet that attracts higher spiritual intelligence to your own sacred space. 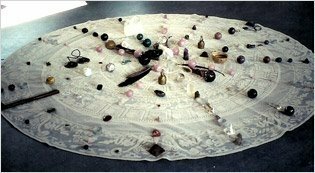 By designing your shrine to include Spirit stones, you can create a fortress of protection that will shield your shrine from psychic attacks or interference from negative ethereal or astral entities as well as creating a space where you can manifest the outcomes you wish by channeling the thoughts with assistance from the spirit stones working together is an expanded way to serve the larger picture and destiny of humanity in this trying time. This principle works much the same in altars, the setting of much of a magician’s work. Spirit Stones can provide exponential empowerment in spell-casting and ritual work. Certain configurations can offer the keys to open doors to exciting different realms. Configurations like these can aid in manifestation rituals, where magickal objects are retrieved from the realms of the fairy and other magical dimensions. In fact, many of the shamans we aquire our spirit stones from have employed magickal configurations that not only aid in their ritual labors, but that also boost their odds of success when questing after yet undiscovered Spirit stones!